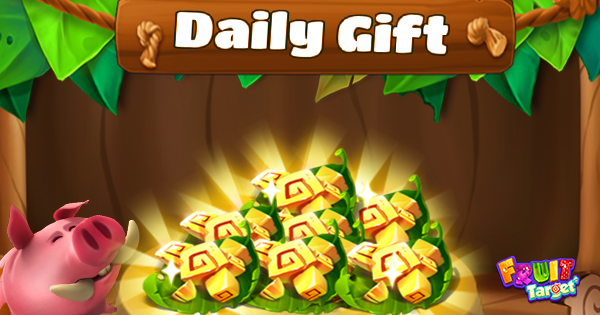 The Daily Gifts gives you random rewards according to your login times every day. The system will automatically reset to another gift within 4 hours, it means each day can have a variation of rewards. Each time, you can earn up to 1000 gold. Remember to login every day to get more gold! There are always new quests from time to time, don't forget to do it! Because you are able to collect a lot of gold from here. You can change to another quest by clicking on the icon besides it. Additionally, players will be given the Honey item to open the Apple Chest where is on the top of Daily Quest box and claim gold after that. A huge source of gold you can find from here! This shooting mode will provide you 3 combos to choose which are Free Combo, Hidden Combo & Combo Quest. Each combo has its own characteristics. If you are looking to claim gold as much as possible, playing Hidden Combo and Combo Quest is the faster way, especially in Combo Quest. It is important that you can play comfortably without time limit. Just shoot fruits as much as you can. Completing one of the five chains but the quests aren't showing up on the screen. The quests consist of five types of fruits which are placed below the banana leaves. The fastest way to find gold is to play in Fruit of Arena but you have to be a winner in each battle. Whenever you win the battle, a Arena Chest will be given according to your current Arena Rank, then you can earn up to 1000 gold! Moreover, the winner will receive crowns to open the Apple Chest outside Arena. However, it is not that simple! Competition, challenge and skills will be required. But let's try to hunt gold in this way, you will definitely feel satisfied. Just win a game and you are done. By joining a tribe, you can earn gold from your tribe friends. You will receive the request of item from friends in your tribe. If you accept their requests and give them special items, you will get back gold. Maybe it isn't so much but the more friends the merrier. Try to join a friendly tribe and get gold anytime! If you'd like to get gold to shoot incontinently, this is the fastest way. Of course, Fruit Target has many special offers for players to choose, especially for the first purchase. Whatever package you buy, surely you will get a good deal!